Despite running a part time schedule due to a limited budget, Salida’s #6, “Slammin” Sam Solari has shown he is a threat to win anytime and anywhere he races. Making just his fifth Stockton 99 Speedway appearance of the year, Solari survived several early race incidents, then drove away from the 20 car field during the last two thirds of Saturday’s 100-lap feature to claim the victory in round #5 of the HOTWOOD 1000 Series by JM Environmental for the Havoline Western Late Models. 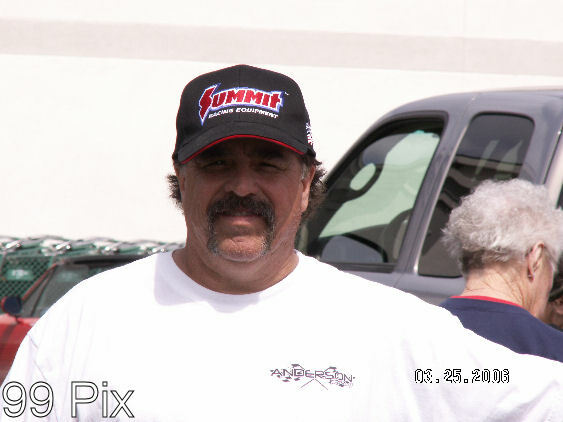 The victory was Solari’s second at the 99 Speedway this season and combined with his win in his only appearance at Altamont Raceway this year, he has now taken the checkered flag in half the races he has entered in 2006. Solari, a Late Model rookie out of the Grand American Modified ranks, was quick to give credit to his team, which includes NASCAR Southwest Series regular Eric Holmes of Escalon. Tim Spurgeon #78, of Danville was the surprise fast qualifier on the night and he sat on the pole of the 20 car HOTWOOD feature courtesy of an invert draw of zero. Spurgeon quickly had his hands full with Dave Byrd, #21, of Pacific Grove as soon as the green flag fell, losing the lead to the former track champion by the end of the first lap. On lap 27 Pete Hernandez of Chicago Illinois was running in fourth when he spewed oil completely around the track causing defending track champion and 2006 points leader Pete Anderson Jr., #5, of Stockton to brush the wall and follow Hernandez to the infield. While Hernandez was done for the night, Anderson was able to make repairs and return to the track to salvage a seventh place finish. Solari inherited second after Spurgeon, #78, also went to the pits when he clipped the wall while warming his tires for the restart. Although he would return from that accident, Spurgeon would eventually call it a night after lap 78. The greasy track conditions caused #21, Byrd, who typically prefers the high side for restarts, to elect the inside lane following a lap 32 caution. Much to Byrd’s chagrin, when the green flag flew, Solari hooked up on the outside and charged to the lead where he checked out on Byrd and the rest of the field. Following Solari and Byrd across the line were Guy Guibor of Manteca, Stockton’s Ron Strmiska Jr., who was recovering from a bought with the flu, and Eric Humphries of Chowchilla. In one of the most exciting races of the year, Pete Anderson Sr., #85, of Stockton outlasted #6, John Medina of Galt and Chad Holman of Stockton to earn his first win of the season in the 30-lap American Limited Stock Car main. Anderson and Medina went at it side by side for several laps before Anderson was able to gain the upper hand and assume the lead on lap 13. Medina regained the lead only to lose it again to Anderson as the front runners sliced and diced there way through lapped traffic for the next 15 laps. Anderson survived one final caution, which set up a green-white-checker finish, to secure the win. Medina just edged out Holman for second as the two crossed the finish line door to door. Lathrop’s #6, Mark Henslee cruised to victory over Eric Figone, #24, of Stockton and Bryan Hitchcock #38, of Valley Springs in the 25-lap Pro 4 Truck main. It was a perfect night for Henslee, who also won the dash and set fast time. “The truck is really hooked up. My crew has it set up perfect. I just drive it on the rail that they set out there,” said Henslee, a four time main event winner in 2006. Manteca’s Jacob Gomes, left, age 13, outraced his younger brother, Joshua age 11, right and the rest of the 16 car field in posting a convincing win in the 20-lap Young Guns Mini Cup main. Jacob Gomes has now won 11 straight events at Stockton 99 and 21 of the last 23 overall in the division during the past two seasons. Front runners Johnathan Hale, #15, of Rio Linda and Mike Conti of Tracy battled side by side in the early stages of the Baby Grand 25-lap feature when the two touched on lap five sending Hale into a spin. After being sent to the back for his part in the incident, Conti was able to work his way through the seven-car field and regain the lead on lap 12, which he never relinquished. 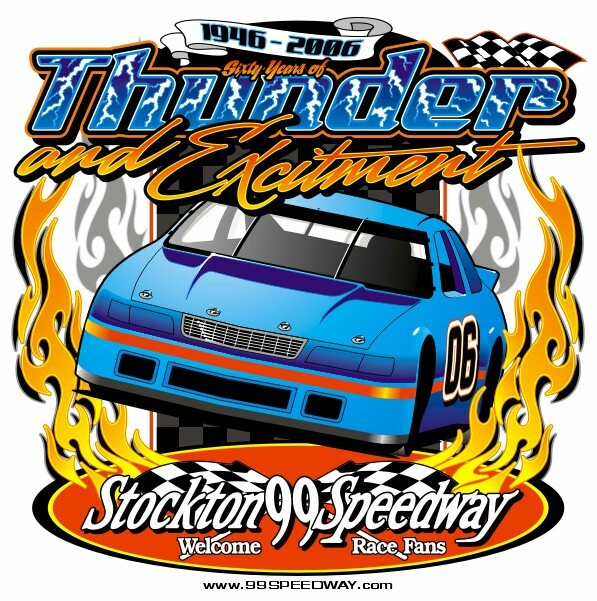 The NASCAR Dodge Weekly Racing Series will be back at Stockton next Saturday, June 17, with triple 50-lap features for the Havoline Western Late Models, Grand American Modifieds and American Limited Stock Cars. The Legends will complete the program presented by Havoline/C.L. Bryant.